Common projects promoting integration into the labour market are implemented. Since 2004 three projects intended to help the Roma experiencing social risk and social exclusion integrate into the labour market have been implemented. The implementation of the projects required the development and testing of Roma employment models, preparation of training programmes and of methodical recommendations for recruitment professionals. 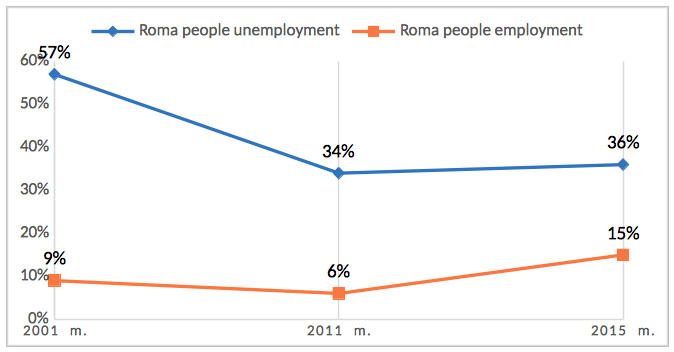 At present, the project “Let us work together with the Roma – new job opportunities and challenges“. The goal of the project that is subject to the implementation during the period of 2016-2020 is the provision of services of integration into the labour market to the Lithuanian Roma communities. The project will combine activities that help to gain formal and informal Roma-adapted vocational training as well as to perform apprenticeship in the workplace with a mentor by trades or crafts that will be selected and discussed in detail with social workers and that will be described in individual personal career plans. In order to form social and employment skills of the Roma engaged in the project, to motivate, to adequately evaluate personal needs, the project participants will be provided with social workers’ consultations. Social workers will also provide the Roma with the accompanying and mediation assistance in dealing with authorities. Information about social services and other project activities will be provided to the Roma by assistant social workers, they will also identify potential project participants, invite to take advantage of the services provided, motivate the Roma to participate in the project activities and employment. These services are planned to be provided in 6 Lithuanian municipalities.